It was late 1937. The Kay Kyser band was already two and a half years into their Brunswick contract and had scored four top twenty hits. The band's theme song, "(I've Grown So Lonesome) Thinking of You", "Star Gazing", "Did you Mean It? ", and 'Cause My Baby Says It's So" had done well for them, but Kay wouldn't have his first number one record until a year later in December of '38 when "The Umbrella Man" topped the charts. 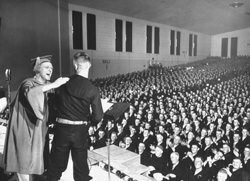 No doubt newcomer Harry Babbitt's fine duet harmonies with Ginny Simms had something to do with the successes which were rapidly beginning to come their way. By now the band had returned to Chicago's Blackhawk restaurant and club. They'd completed lengthy engagements at the Trianon and other first class night spots, and were ready to settle in for a while at the well known Chicago night spot. They were drawing quite well on the weekends, but their Monday nights were slow. 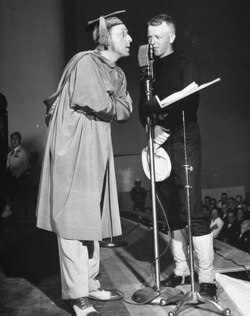 Since Chicago was a big show biz town, Kay began inviting bandleaders and celebrities who were in town for a performance over to the Blackhawk after their regular show at the Palmer House or wherever they were booked while in 'Chi-town'. Calling the Monday night show 'The Midnight Flyer', Kay would interview them over Chicago's WGN radio, part of the Mutual network, and perhaps coax a performance out of the celebrity. Kay kept a checkbook inside the piano bench, and would pay a nominal fee to the artist for showing up, being interviewed, and giving a brief performance. Soon, the head of the Musician's Union, James C. Petrillo heard about the practice and insisted it stop. Kay then decided since Petrillo had no jurisdiction over the audience, the Midnight Flyer would become an audience participation show. Maybe a talent or quiz show, since quiz shows were becoming popular. Someone remarked that since Kay's high forehead, glasses, and bookish demeanor made him look like a professor, perhaps a school oriented program would work. However, the thought sounded rather boring for a nightclub show until it was suggested that Kay play against type, tease the contestants a little, ask them to identify a song in the first few bars (later adopted by Name That Tune), and perhaps talk about themselves a little. Some contestants were funny, some not, and it was up to Kay to turn the proceedings into something radio worthy. Kay became the teacher, and the show came to be called Kay's Klass. With his professorial persona, Kay acted just the opposite of a stern school teacher. He'd dance around, make faces behind the contestant's back, and respond to incorrect answers with, "That's right, you're wrong!" (later the title of the first of seven Kyser films). It's said that Kay's agent at the time, a young Lew Wasserman (later one of the most important Hollywood moguls of the twentieth century), suggested a schoolroom setting, with the band being the 'students', who would wear letter sweaters with KK across the front. 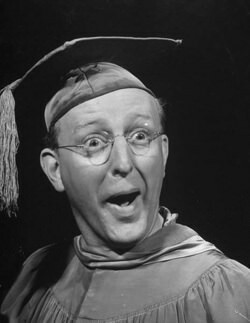 Kay himself wore a professor's cap and gown. Soon the 'students' would be the audience. In between the question and answer sessions, the band would play their latest Brunswick recording or hits of the day. In an interview, Kyser described his and the band's brainstorming technique. "I thought 'Wouldn't it be great if we asked the listening audience some questions. Somebody said, 'Yes, and then why don't you ask them to mail in their answers', and then somebody said, 'Yeah, let's give 'em a diploma." So we did. We thought we'd get three or four replies, ten maybe. So two days later the mailman showed up with two bushel baskets full of these responses. We were flabbergasted. I'd made this promise on the air, and they'd put me in jail if I didn't fulfill it, you know." He continued, "So we had this diploma designed, and we mailed 'em all out. Soon the mail increased, and it got more than I could sign. Ish Kabibble and Ginny Simms and a dance team at the Blackhawk all learned to sign my name as well as I did, and we got to where we sent these things out by the thousands!" Harry Babbitt continued the story, "One of our publicity guys hit upon an idea when he heard about all the mail we were getting. They took a couple of these large sacks full of letters up to the office of George Washington Hill, president of the American Tobacco Company and dumped them out onto his desk. Hill asked, "What the 'H' is this?" And when he was told about the success of the show, he said, 'Buy it!'." The show was purchased, and within two months would go on the national NBC airwaves for Lucky Strike. It was currently still on the Mutual network, but on Feb. 1st, 1938 began broadcasting from the WGN studios there in Chicago. Kay was referred to as the 'Old Music Master'. The "Ol' Professor" tag was yet to come. In March of 1938 the band pulled up stakes and the show moved to New York City. That first New York show for Lucky Strike was broadcast from the Broadway district's New Amsterdam Theater on Wednesday, March 30th, 1938. I have Kay's personal script from that show in my collection, a gift from Georgia Kyser, Kay's widow. Shortly, the show would emanate from NBC's Rockefeller Center studio 8H, years later the home for NBC TV show, Saturday Night Live. The name would also change, due to Kyser band member Sully Mason's suggestion, to Kay Kyser's College of Musical Knowledge. By the way, one often sees the program spelled as "Kollege", but the show's official spelling was always "College". 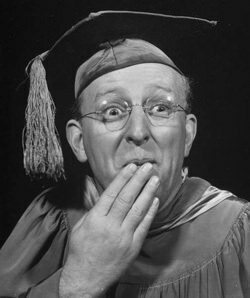 See also: Kay Kyser's Kollege of Musical Knowledge Collection. Steven Beasley's professional past includes such music related assignments as assistant director of the scoring stage at Paramount Pictures, Hollywood, in the early 1990s. 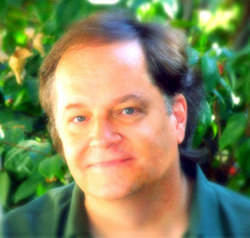 As an author Beasley has had several Kyser articles published internationally and in the U.S. As a songwriter/producer he's placed several of his songs in films, and wrote/performed musical scores for comedy shorts by comic/actor Larry Hankin that have been shown on Showtime, HBO and various cable channels in Europe. Beasley currently owns and operates a 24 track digital facility in the Los Angeles area, where he resides with his wife and two children. 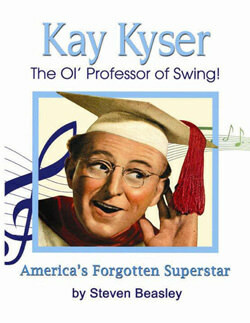 KAY KYSER- THE OL' PROFESSOR OF SWING! AMERICA'S FORGOTTEN SUPERSTAR by author Steven Beasley is the first full length (346 pages) biography published on the man and his band who in the 1930s and 40s set swing music on its ear – then disappeared! It includes full discography, filmography, over 100 rare photos, and profiles of featured Kyser players Ginny Simms, Harry Babbitt, Ish Kabibble, Sully Mason, Georgia Carroll Kyser, and of course, the story of the "Ol' Professor" himself, Kay Kyser. Beasley has diligently researched the Kay Kyser Orchestra for the past twenty years, getting their history first hand and gaining acceptance from former band members, friends, and the Kyser family. For further information, please visit book website. Be the first to comment on "Kay Kyser: Opening the Kollege Doors..."